Major General Joseph J. Kruzel was deputy director of operations, Deputy Chief of Staff, Plans and Operations, Headquarters U.S. Air Force. General Kruzel was born in Wilkes-Barre, Pennsylvania, in 1918. He graduated from the University of Scranton, Scranton, Pennsylvania, in 1938, with a bachelor of science degree in chemistry and in 1939 was awarded a bachelor's degree in education from the same university. In May 1940 he entered the U.S. Army Air Corps and after completing primary and basic flying training at Parks Air College, East St. Louis, Illinois, and Randolph Field, Texas, was commissioned a second lieutenant and received his pilot wings at Kelly Field, Texas, in December 1940. His first assignment as a commissioned pilot was at Clark Field in the Philippine Islands. He was stationed at Nichols Field, Manila, when the Japanese attacked Pearl Harbor and the Philippine Islands. During the early years of World War II, as a combat fighter pilot in northern Australia, Java and the Philippines, General Kruzel flew P-40 fighters, downed one Japanese Zero fighter and logged 175 combat hours. 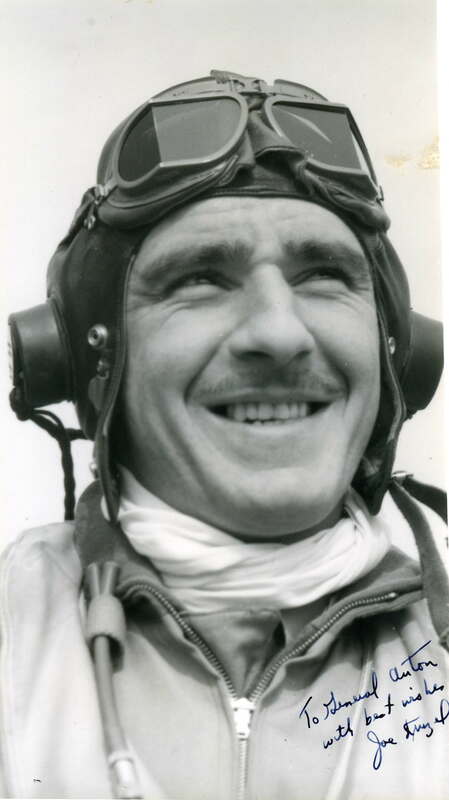 In 1943 he became squadron commander and later deputy commander of the 361st Fighter Group at Richmond, Virginia, and went to England in November 1943 with the group, where he flew P-47 and P-51 aircraft. During his tour of duty in the European Theater of Operations he logged 325 combat hours, destroyed three German ME-109s and one FW-190 to become an American ace with four German and one Japanese fighter aircraft to his credit. During 1945 General Kruzel was deputy base commander at Seymour-Johnson Field, North Carolina, which was a P-47 Combat Crew Training School and later a separation center. In January 1946 he attended the senior officer's Asiatic Study Course at Yale University. He was assigned to the Air Office of the XXIV Corps, in Seoul, Korea, in April 1946. He served with Headquarters Far East Air Forces in Tokyo, Japan, from May 1947 to September 1947, followed by a tour of duty as commander of the reactivated 18th Fighter Group, which was equipped with P-47 and subsequently P-51 aircraft at Clark Field, Philippine Islands. In 1949 General Kruzel attended the Air Command and Staff College at Maxwell Air Force Base, Alabama, and upon graduation was assigned to the War Plans Division, Headquarters U.S. Air Force. He later attended the Air War College at Maxwell Air Force Base, graduating in June 1954. He was retained at the Air War College as a member of the Evaluation Staff through May 1957. In June 1957 General Kruzel was assigned as chief, War Plans Division, Headquarters U.S. Air Forces in Europe, at Wiesbaden, Germany; and in January 1958 as chief, command post, Supreme Headquarters Allied Powers in Europe, in Paris, France. He returned to the United States in July 1960 and attended the National War College. He next was assigned as vice commander of the 354th Tactical Fighter Wing, equipped with F-100s, at Myrtle Beach Air Force Base, South Carolina, and he became commander of the wing in April 1963. He assumed command of the 832nd Air Division, Cannon Air Force Base, New Mexico, in January 1964. In August 1965 General Kruzel was assigned to Headquarters Pacific Air Forces, Hickam Air Force Base, Hawaii, as director of operations and in August 1966 became deputy chief of staff for operations. In August 1968 he was assigned as vice commander of Fifth Air Force (PACAF) with headquarters at Fuchu Air Station, Japan. General Kruzel returned to the United States and was assigned in August 1969 to Headquarters U.S. Air Force as deputy director of operations, Deputy Chief of Staff, Plans and Operations. His military decorations include the Silver Star with two oak leaf clusters, Legion of Merit, Distinguished Flying Cross with oak leaf cluster, Air Medal with three oak leaf clusters, and the Bronze Star Medal. 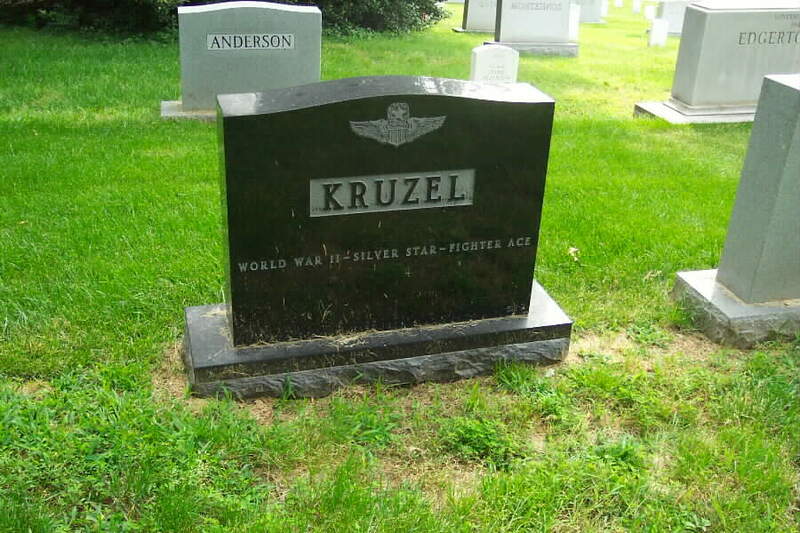 Major General Joseph J Kruzel, U.S. Air Force, retired, died at home July 9, 2002. Born 1918 in Wilkes-Barre, Pennsylvania, to John and Mary Kruzel, he was the oldest of three sons. His brothers were Louis and Henry Kruzel. After graduating from the University of Scranton in 1943 he married Violet M. Clark and had four children, Joseph John, Victoria Leigh, David Charles and Daniel Peter. They were married 36 years until her death in 1979. Joe Kruzel’s military career began as an Aviation Cadet in May, 1940. His first assignment was to the Philippines, where he flew P-40’s in the 17th. Pursuit Squadron when the Japanese attacked in December, 1941. During the first year of war, he was credited with destroying 3 Japanese fighters. On his return to the U. S. as a Captain, he became a P-47 Squadron Commander at Richmond, Virginia, where he was later chosen to be the Executive Officer of the 361st. Fighter Group which went to England in November, 1943. In Europe, he was credited with destroying 3.5 German fighters. He became Fighter Group Commander of the 361st. in September, 1944. Other commands include F-100 Fighter Wing and an F-100 Air Division. Key staff posts were in Operations at Headquarters PACAF and at Headquarters, USAF, Pentagon. Medals awarded were Silver Star with 2 Oak Leaf Clusters, Distinguished Flying Cross, with Oal Leaf Cluster, Distinguished Service Medal and Presidential Unit Citation. He retired in August, 1970 as a Major General. Joe Kruzel has lived in the Fort Walton Beach area for the last 32 years. He married Betty Sue (nee Tucker) in 1984. They have resided at 857 East Miracle Strip Parkway, Mary Esther, Florida for the past 18 years. He is survived by his wife, Betty Kruzel; his brother, Louis Kruzel of Wilkes-Barre, Pennsylvania; three children: Victoria Farrell of Alexandria, Virginia, David Kruzel of Bend, Oregon, and Daniel Kruzel of Campbell, California; and nine grandchildren, Sean Farrell, Kelly Lowder, Sarah Kruzel, John Kruzel, Karly Kruzel, Katie Kruzel, Hayley Kruzel, Marina Kruzel and Suzanne Bratton; and four great-grandchildren. A memorial Mass will be held Saturday, July 13, at 2 p.m. at Eglin Air Force Base West Chapel. Burial will take place at Arlington National Cemetery. General Krunzel was buried in Section 30 of Arlington National Cemetery. 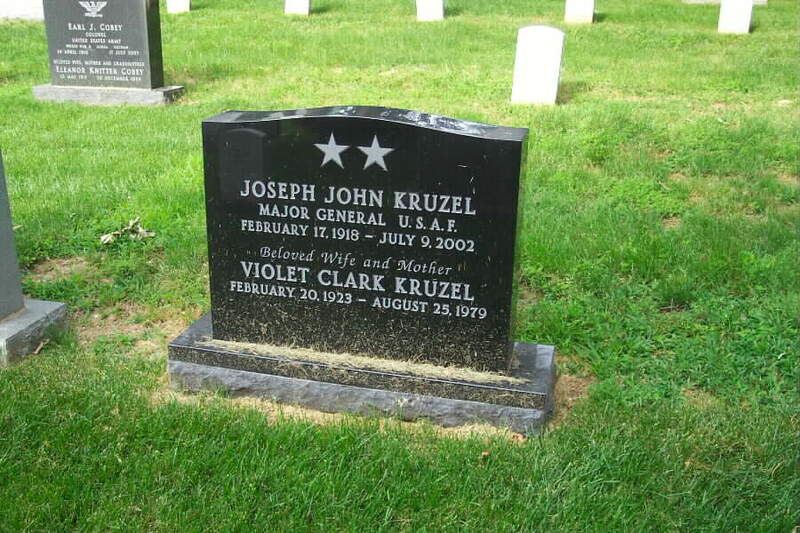 His wife, Violet Clark Krunzel (20 February 1923-9 July 2002) is buried with him. 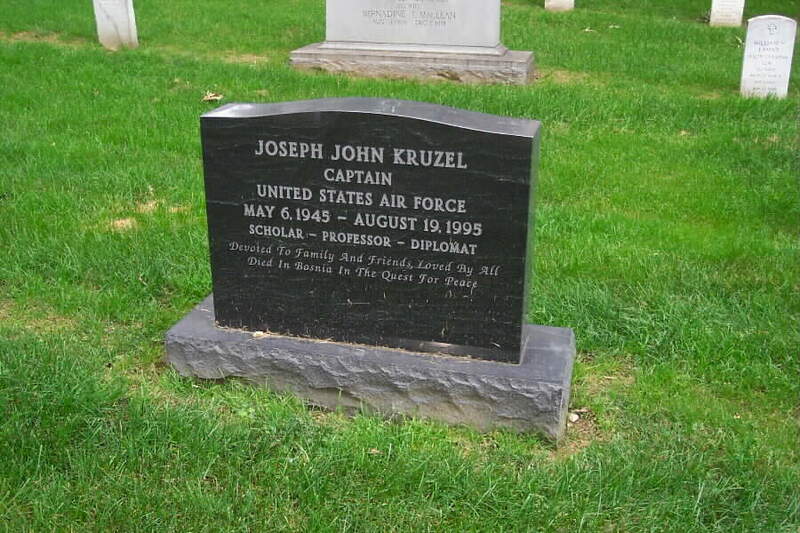 Buried next to them is their son, Joseph John Krunzel, Captain, United States Air Force, Scholar, Professor, Diplomat, 6 May 1945-19 August 1995.